Resveratrol Complex is a proprietary blend of Resvinol-25™, Red Wine Extract, Grape Seed Extract, and Pine Bark Extract. The television and newspaper media have featured stories about the health benefits of red wine, citing research that suggests that red wine may lower the risk of developing certain diseases. Other research studies, from around the world on the polyphenols found in red wine and other plants, suggest that polyphenols may help improve overall health and longevity. 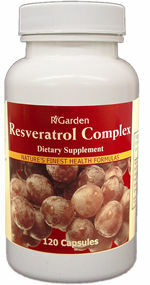 Our Resveratrol Complex brings together high-potency antioxidants to help you get your body systems back into balance. These powerful extracts contain beneficial polyphenols, including quercetin, resveratrol, proanthocyanidins, and anthocyanins. Resvinol-25™ is a proprietary extract containing concentrated levels of polyphenols and resveratrol from red wine and Japanese knotweed. Take one or more capsules daily, preferably with meals. Caution: As with any product, discontinue immediately if adverse effects occur. Did you know that grapes could help improve your health? People around the globe have enjoyed grapes and grape products for thousands of years. Grapes are grown in many countries. In 2006, the world grape production was over 13 million tons. There are many varieties of table and wine grapes grown, each with its own unique flavor, texture, and color (basic colors are: red, green, and blue-black). Consumption of both unfermented grape juice and fermented juice (wine) is popular in many cultures. Historically, grapes and portions of the grape plant have been used to treat a variety of health conditions. This is due to the astringent properties of the grapevine, almost like a living pharmacy. Various portions of the grapevine produce their own protective agents. For example, grapes protect themselves by producing a pesticide and a fungicide. The leaves make their own sunscreen and fungicide. And, the best part of all of this is that our bodies can benefit from these natural nutraceuticals as well. Grapevines contain beneficial polyphenols (antioxidants). The most commonly researched polyphenols are quercetin, resveratrol, proanthocyanidins (from seeds), and anthocyanins. Interest in the potential health benefits of grapes and wine has intensified over the last few decades as researchers sought to understand what's been called the "French Paradox". The French have a diet rich in meat, cheese, and butter and yet have lower incidences of diseases associated with a high fat diet. Several researchers have theorized that the French population's significant consumption of red wine could account for the lower incidences of health problems. This has prompted further research into the components of grapes and wine. Two compounds that are of particular interest are resveratrol and proanthocyanidin. Resveratrol is a naturally occurring antioxidant found in grapes and peanuts. It is present in grapevines, seeds, and roots, but the highest concentration is found in grape skins. The concentration of resveratrol is much higher in red wine than white wine due to the grapes used and the production process. For red wine, the skin and the seeds are involved in the process and the beneficial polyphenols are transferred to the wine. Proanthocyanidin, also known as oligomeric proanthocyanidin (OPC), is a class of flavonoids found in pine bark, grape skin, grape seed, and to a lesser degree in bilberry, green tea, black tea, black currant, and cranberry OPCs are water-soluble, which allows them to be readily absorbed by the body. They are capable of crossing the blood-brain barrier to protect brain cells. Of these, grape seed extract is the primary commercial source of OPCs because of its lower cost and because it contains an additional antioxidant not available in pine bark. Red wines tend to have a substantially higher amount of OPCs than white wines. Both resveratrol and proanthocyanidin have natural polyphenols that provide many health benefits. First, they act as powerful antioxidants helping the body neutralize free radical damage, believed to play a part in organ deterioration and aging. These antioxidants are even more powerful than vitamins C and E. They support cardiovascular health by helping the body sustain healthy cholesterol levels and influencing blood chemistry. Research has shown that they can help normalize certain brain proteins to improve memory functions. They seem to stimulate the cells to produce bones and preserve bone strength. Clinical studies with grape seed extract have shown improvements in stabilizing blood sugar, metabolizing fats, and controlling appetite. Research suggests that the components in red wine can provide significant health benefits. One must also understand that excessive consumption of alcohol can have detrimental effects on the health of the body. Those who drink have a significantly higher risk of experiencing a life-threatening health condition. There is a much easier way to realize these important health benefits without drinking red wine. Modern processing methods have made it possible to concentrate these powerful ingredients from grapes and other plants so they can aid in the pursuit of better health. For example, the manufacturer of Resvinol-25™ has a high potency product in which every 100 mg contains the resveratrol equivalent of 35 glasses of red wine. The extensive research done on resveratrol and proanthocyanidin suggests that these two plant compounds appear to provide a novel solution for individuals seeking to keep their health at optimal levels. These compounds seem to provide a means for improving the balance of body systems and enhancing longevity. Resveratrol Complex contains a powerful blend of Resvinol-25™, Red Wine Extract, Grape Seed Extract, Pine Bark Extract, and an enzyme activation system to aid with absorption. The Resvinol-25™ is a proprietary extract from Red Wine Matrix and the root of the Japanese knotweed providing concentrated levels of polyphenols and trans-resveratrol. The high-potency Red Wine and Grape Seed Extracts provide additional polyphenols to boost the potency of the formula. Pine Bark Extract is included to provide additional bioflavonoids from a standardized concentration of 95 percent Oligomeric Proanthocyanidins. Each vegetarian capsule contains 540 mg of these high potency, alcohol-free ingredients. ~ An article published in a 2006 issue of Nature examined the effectiveness of resveratrol for extending life expectancy and reversing the complications of obesity. Laboratory mice were divided into three groups. The first group was given a high-calorie diet in which sixty percent of the calories were from fat. In addition, the mice received resveratrol, a concentrated red wine extract. The second group was given the same high-calorie diet, but without the resveratrol. The third group received a standard, low-calorie diet. When researchers compared the two high-calorie groups, they observed that resveratrol lowered the death rate by thirty-one percent and decreased obesity-related complications related to diabetes and heart disease. The resveratrol group had similar health readings as the low-calorie group. ~ In a study published in a 2006 issue of Current Biology, researchers examined the impact resveratrol might have on extending the lifespan of short-lived fish. For this study, researchers used 157 short-lived seasonal fish, Nothobranchius furzeri, with an average lifespan of nine weeks and a maximum-recorded lifespan in captivity of thirteen weeks. At four weeks of age, the fish were split into four groups. The control group contained forty-seven fish and received a standard food diet. The other three groups were fed food containing a resveratrol supplement in three different concentrations: thirty fish received 24 micrograms/gram of food, sixty fish received 120 micrograms/gram of food, and twenty fish received 600 micrograms/gram of food. Fish in the control group had a survival rate consistent with the expected lifespan of the species. Fish in the lowest resveratrol group (24 micrograms/gram of food) had life spans similar to the control group. Fish in the second resveratrol group (120 micrograms/gram of food) had an increase in median and maximum life spans of thirty and twenty-seven percent respectively. Fish in the third resveratrol group (600 micrograms/gram of food) had an increase in median and maximum life spans of fifty-six and fifty-nine percent respectively. Researchers observed that the fish in the last group continued to reproduce at age twelve weeks while all the fish in the control group had died. In addition, researchers tested all fish during the study and found that the fish receiving the resveratrol showed good preservation of learning skills and a decrease in age-related brain deterioration. Researchers concluded that resveratrol significantly prolonged the life of short-lived fish and delayed the start of age-related memory problems. ~ In a study conducted at the University of California - Davis campus, cardiovascular researchers examined the effects grape seed extract had on blood pressure. For this placebo-controlled study, twenty-four male and female subjects diagnosed with metabolic syndrome were divided into three groups of eight. Metabolic syndrome is a collection of medical disorders, such as obesity, high blood sugar, high blood pressure, and high triglycerides that increases one's risk for cardiovascular disease and diabetes. During this one-month study, the first group received daily doses of a placebo, the second group 150 mg of grape seed extract (GSE), and the third group received 300 mg of GSE. The blood pressure of all patients was automatically measured and recorded for twelve hours following ingestion. Patients in the two grape seed groups experienced an average drop in systolic pressure of twelve millimeters and a drop of eight millimeters for their diastolic reading. In addition, the group receiving daily doses of 300 mg of GSE saw a reduction in their serum oxidized LDL cholesterol levels. Patients with the highest initial oxidized LDL readings experienced the greatest improvement. Grape seed extract has received a GRAS certification (generally recognized as safe) and has no known side effects. Baur J., Pearson, K et al. "Resveratrol improves health and increases survival of mice on a high-calorie diet." Nature: Nature Publishing Group; October 2006. Ong, David. "Grape Seed May Have Blood Pressure Reducing Qualities." University of California, Davis: Preventive Cardiology Program; March 2006. Valenzano D.R., Terzibasi E., Genade T., Cattaneo A., Domenici L., Cellerino A. "Resveratrol Prolongs Lifespan and Retards the Onset of Age-Related Markers in a Short-Lived Vertebrate." Current Biology (16-3, pg. 296-300): Elsevier: New York; February 2006. Aggarwal B.B., Shishodia S. "Resveratrol in Health and Disease (Oxidative Stress and Disease)." CRC Press: Florida; 2005. Clouatre D. "All About Grape Seed Extract." Avery Publications: New York; 2004. 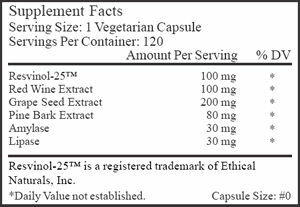 Resvinol-25™ is a registered trademark of Ethical Naturals, Inc.